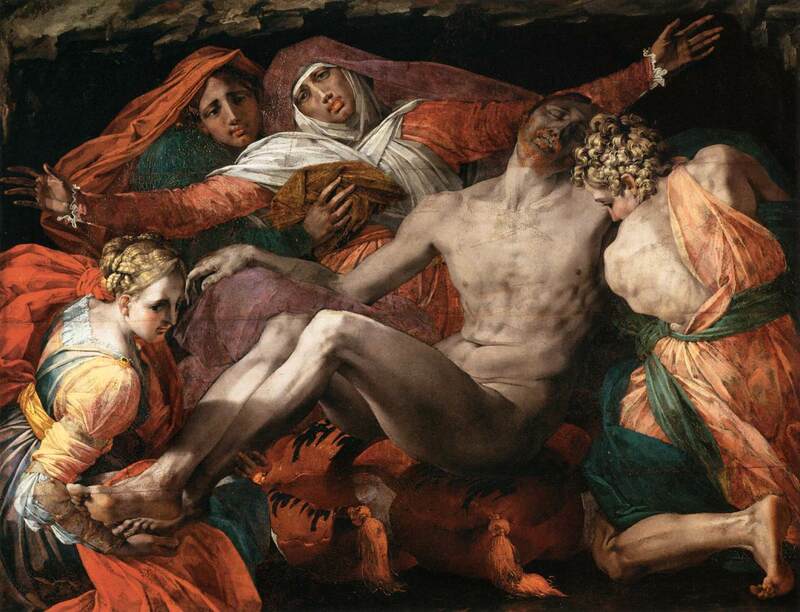 The corpse of Jesus is laid down by women and men into his tomb. The tomb is represented as an open sarcophagus, contrary to the texts which mentions a vault dug out in the rock. The body, wrapped in a white shroud, is put into the sarcophagus or placed on a sort of slab that is the lid. 6 persons are around dead Christ and take part to the entombment. On the left, a woman holds the crown of thorns while, on the right, Mary Magdalene carries a vase. Joseph of Arimathea and Nicodemus lay down the corpse in its shroud; Joseph holds it on the side of his head and Nicodemus on the side of his feet. This position can be explained by their relative social importance; the former is a prominent member of the Sanhedrin Council who has donated the tomb, the latter is but a petty member who has brought some unguents. Mary, the mother of Jesus, presides over the scene; she is placed in the centre or else close to Jesus’ head; her suffering has grown over the centuries and sometimes becomes theatrical. Two other women mentioned in the Gospels bring some perfumes for the embalment; they are Salome, Zebedee’s wife and the mother of the apostles James the Major and John, and Mary, the mother of James the Minor. They are the women that the legend had made into the Virgin Mary’s half-sisters. Mary Magdalene cries while holding a vase of perfume; she is in the centre if the Virgin is placed close to Jesus’ head, or she is at his feet if the Virgin is in the centre of the scene. 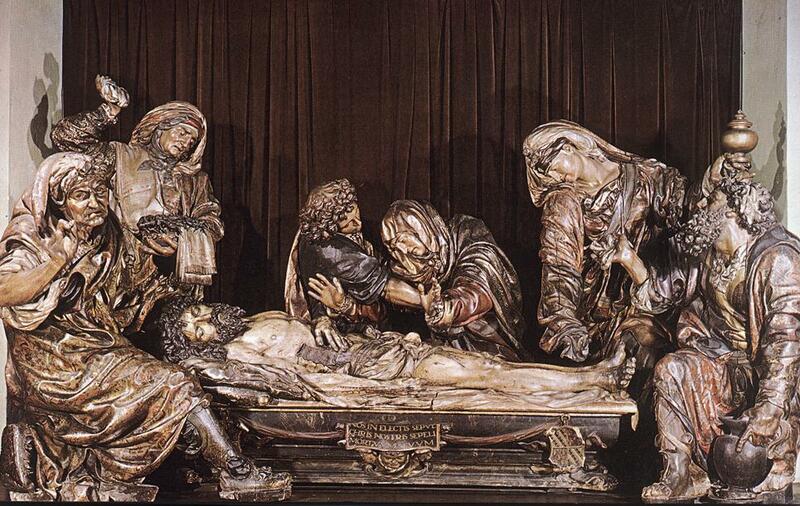 The entombment is often composed with several characters carved life-size; which creates a sort of stage performance. The Deposition; Rogier van der Weyden; c. 1490; oil and gold leaf on panel; J. Paul Getty Museum, Los Angeles. 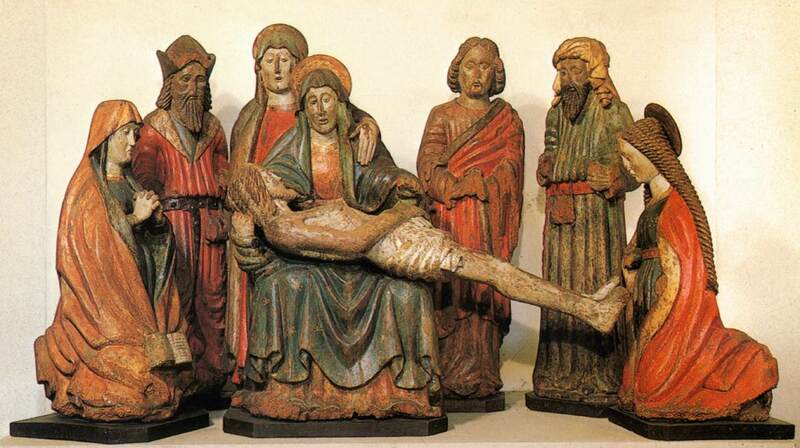 The deposition corresponds to the descent of Jesus’ body from the cross but the positions of the body and of the characters are those of the entombment. The body of Jesus can be placed on his mother’s knees. She is alone or simply surrounded by John and Mary Magdalene. She is called the Virgin of Pity or Pietà. This tragic and particularly moving scene is probably derived from the Virgin and Child, for Jesus dead is sometimes the size of a child and his mother seems to rock him. 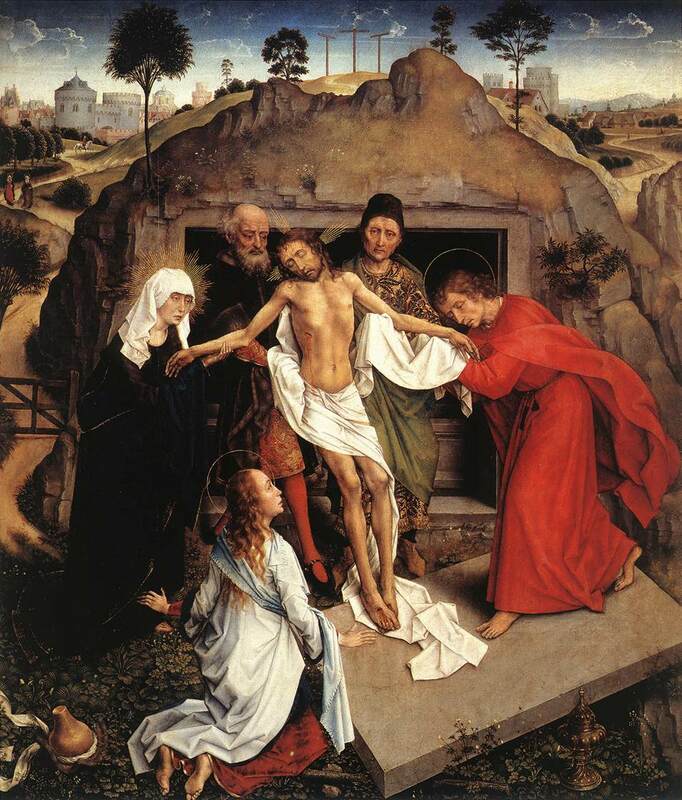 The scene of the burial of Jesus’ body is particularly important for two reasons. It is the death of a real man and not a divine spirit taking a human appearance, and the representation of the entombment precedes the scene of the empty tomb, the sign of the Resurrection. The Body of Christ Borne to the Tomb; William BLAKE; c. 1799-1800; tempera on canvas; Tate Collection, London. The Emtombment; CARAVAGGIO; 1602; oil on canvas; Pinacoteca; Vatican. 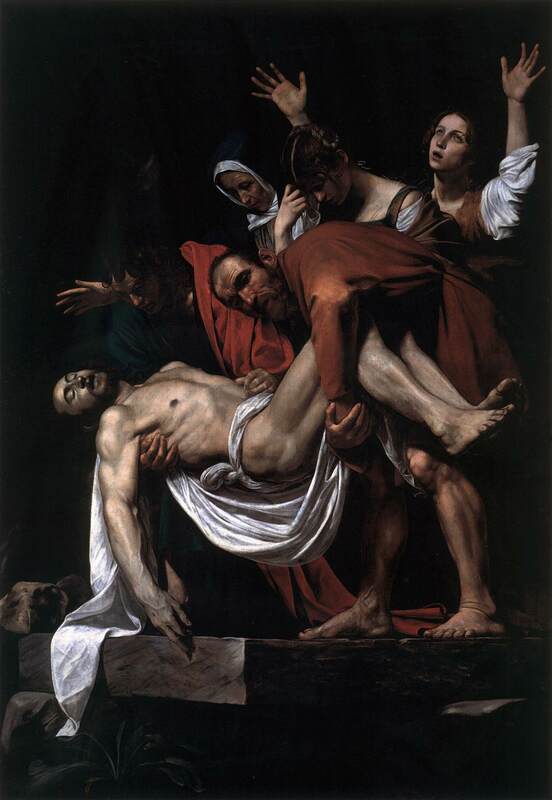 Christ carried to his tomb; Sisto BADALOCCHIO; after 1609, oil on copper; National Gallery, London. 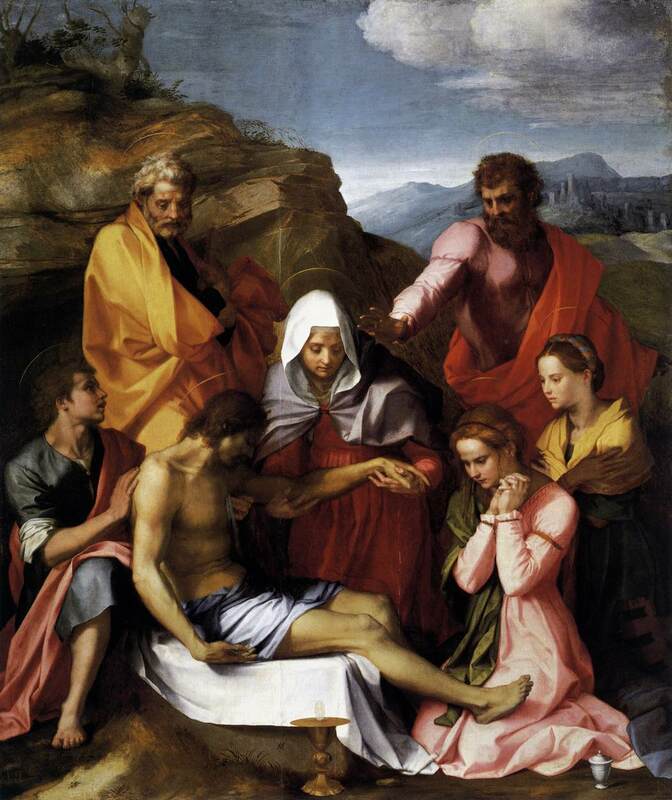 Pietà; Andrea del SARTO; 1523, oil on wood; Galleria Palatina, Palazzo Pitti, Florence. 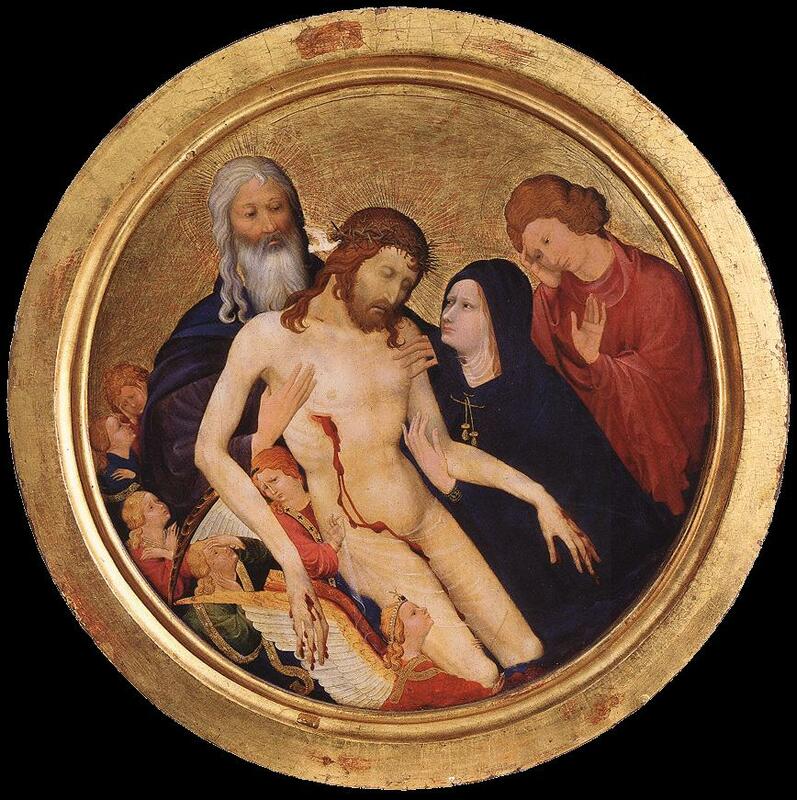 The Deposition of Christ; unknown master; Italian work; c. 1474; painted wood; Museo Civico, Novara. Two different conceptions of the tomb: the dug-out vault and the sarcophagus; only the former corresponds to the text. The Entombment; Rogier van der WEYDEN; 1450, oil on wood; Galleria degli Uffizi, Florence. The deposition on the gravestone. In the Renaissance, some entombments were represented with the corpse of Jesus placed on a slab of stone; he is alone or with Mary. The work sometimes takes the form of a lesson of anatomy. 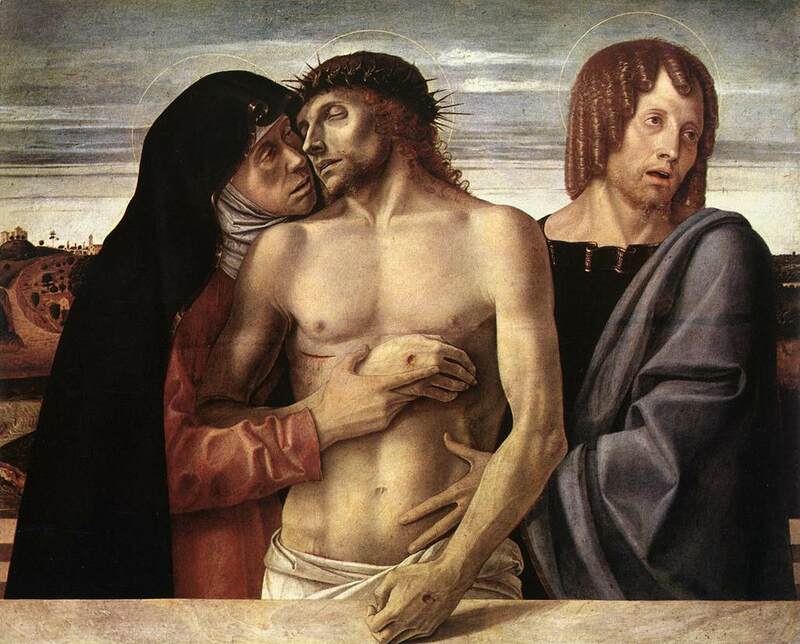 The Lament on dead Christ; Andrea MANTEGNA; c. 1490; tempera on canvas; Pinacoteca di Brera, Milan. 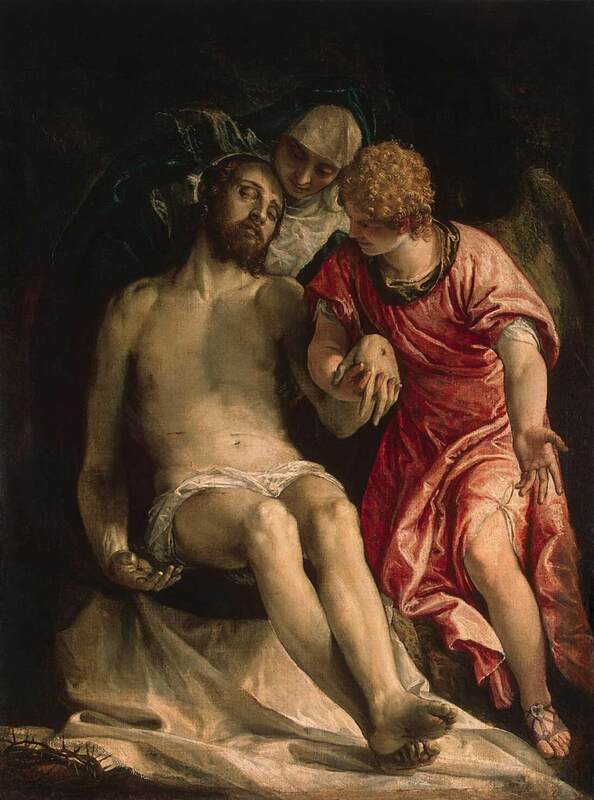 Pietà; Paolo VERONESE; 1576-82; oil on canvas; the Hermitage Museum; St Petersburg. 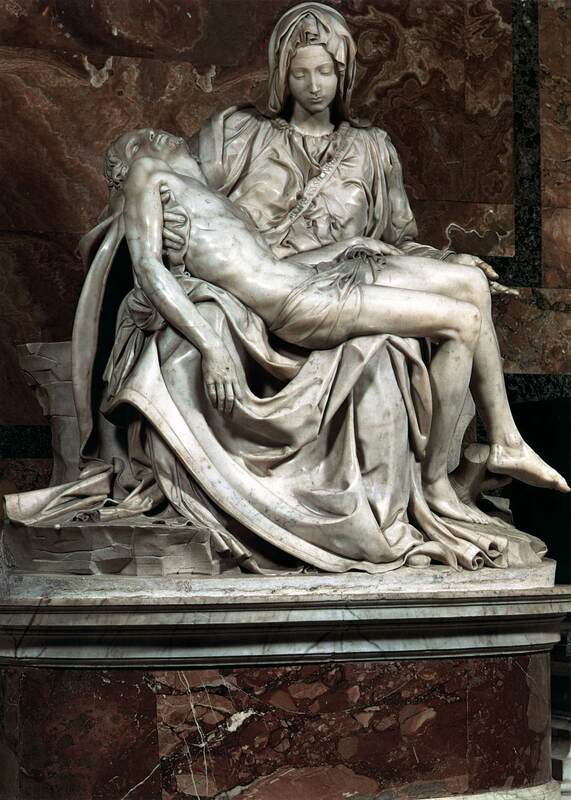 Pietà is the name given to the group formed by Mary bearing the body of her son. On the right, the movement is obviously inspired by the Virgin and Child. The Pietà of Villeneuve-lès-Avignon; Enguerrand QUARTON; 1456-57; panel; Musée du Louvre, Paris. 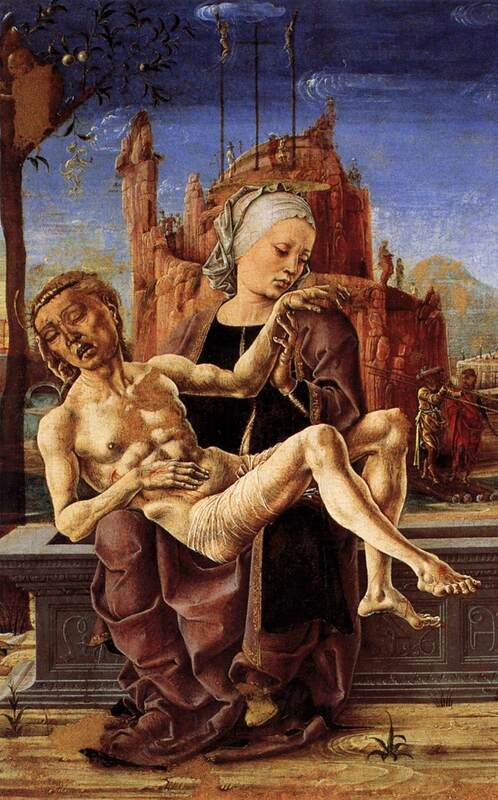 Pietà; TURA Cosmè; 1460; oil on panel; Museo Correr; Venice. The same movement and the same feeling. 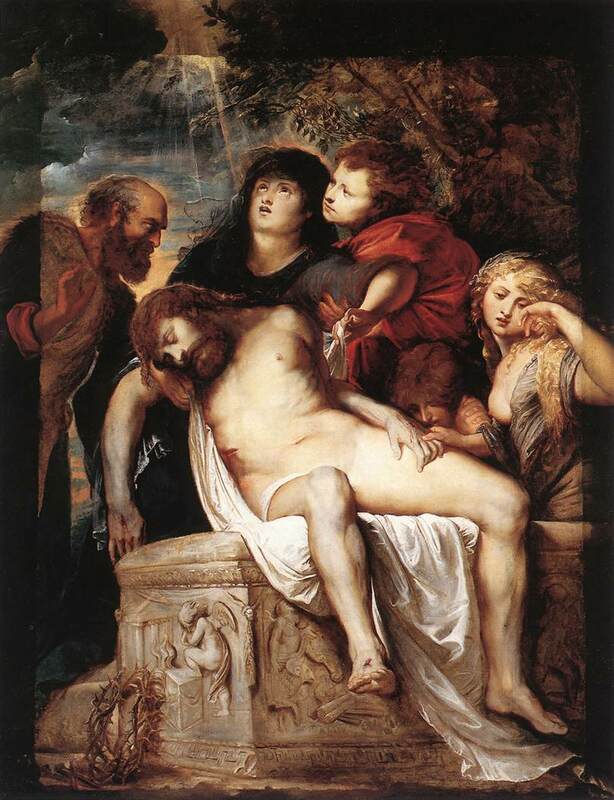 Pietà; Eugène DELACROIX; c. 1850; oil on canvas; Nasjonalgalleriet; Oslo, Norway. 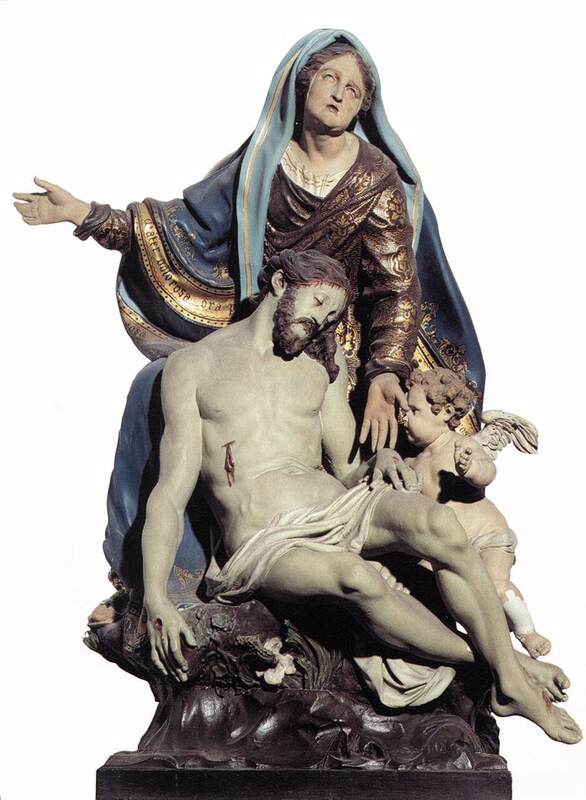 Pietà; Artus QUELLIN; 1660; polychrome wood; De Onze-Lieve Vrouwekathedraal, Antwerp. The body of Jesus is raised in the expectation of the resurrection. To Mary and John whose presence is traditional, Malouel adds God the Father and the dove of the Holy Spirit, thus turning the Pietà into a Trinity. Large Round Pietà; Jean MALOUEL; 1400-10; wood; Musée du Louvre, Paris. Christ supported by the Madonna and St John; Giovanni BELLINI; 1460; tempera on panel,; Pinacoteca di Brera, Milan. is one practice that has nothing specifically Christian but Christianity has given to it a new dimension as the expectation of the resurrection. It is to be noted that the forms of burying have changed and that the dead person, at first wrapped in his shroud and laid down in a sarcophagus or placed in a niche as in the catacombs, has then been put in a closed coffin and buried in the earth. The return of the practice of cremation has at first been considered as anti-Christian but nowadays it has no particular signification particularly in Anglo-Saxon countries.